Fuel for the Mindful Driver: Left Hand Turns-Ingrid Weighton's Driver Education Ltd.
Left hand turns are the most dangerous turns on a two way street, and yet it is the one turn where risks are taken more often then not. There are several reasons why some drivers are failing to either yield to oncoming traffic or enter the intersection when they should have taken the opportunity to stop and wait for the next light. Then there are the ones who feel resentful, that when oncoming traffic run the light, the ability to turn on their own light has been shortened and they want to make up for that. In effect they are passing on the mistake of others by repeating it. And the last group are the ones who really do not know the rules. Their fear is the fear of not knowing and they try to outrun their fear, especially when it gets tricky. Drivers will only ever drive as well as they have gained insight into their own emotional life and take control of it. Unacknowledged emotions will express themselves in risk taking. Police presence and enforcement is one step to changing driver behaviour, but talking about what “drives” the average person is even more important. Gaining insight in one self is more effective in producing lasting change and peace of mind then enforcement will do by itself. 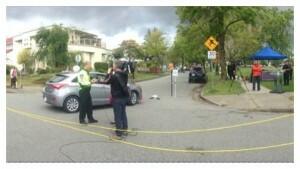 Here is a good article from Global news on what the Vancouver Police Department is doing to combat high-risk driving. Vancouver police are teaming up with other police agencies, the B.C. government and ICBC to kick off their month-long campaign to cut back on high-risk driving…drivers who fail to yield to other drivers and pedestrians, follow too closely and drive at excessive speeds. Police say these types of offences contribute to many collisions that result in injuries or fatalities. Particularly when it comes to left-hand turns at an intersection controlled by traffic lights, they say – don’t rush, yield to oncoming traffic, including cyclists, motorcyclists and pedestrians.